Advanced microprocessors and software that draw less power for faster analysis than others. New optical system and sensor for higher resolution and a larger field of view. Automatic calibration assures the highest precision and ease of use. Graphical User Interface has easily understood icons for all functions. The advanced LED illumination system uses two common AA alkaline batteries for 50,000+ measurement durability found only in this unit, while eliminating the need for constant Ni-Cad recharging. Eliminates cables, and chargers found in other units. Excellent for everyone, especially shops running two or more shifts. COMPLETELY PORTABLE - a "go anywhere, all the time" instrument. (Even to 10 micron stochastic) Every measurement uses the automatic calibration function, no need to calibrate the instrument for different screen rulings, angles, etc. Higher precision with supercell, hybrid, and stochastic halftoning on all plates and substrates. Dot Area, Screen Ruling, Screen Angle, and Dot Diameter with every measurement. High Resolution image zoom at the touch of a button, critical in determining dot quality as it affects printability and CAP resolution. Images and data can be downloaded for documentation and characterization with BetaTAb II software. Available in three versions, (Basic, Advanced, or Ultimate) to match your exact needs and budget! The most advanced features for all levels of production. 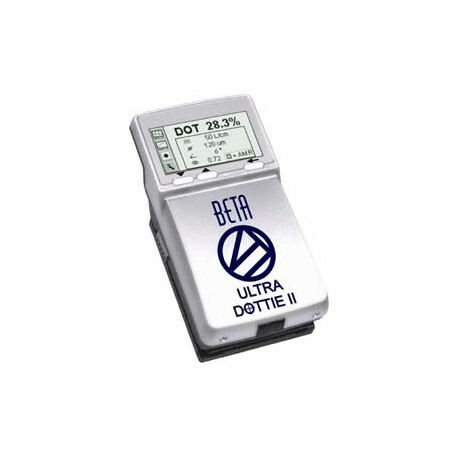 Every version includes an Ultra Dottie II Support Pack (values at $939.00) at no additional cost. Beta Tab II:	downloads data and images into your favorite spreadsheet or other calibration utility. Beta Target assures instrument is in verifiable calibration which can be downloaded into your database. For Windows only. 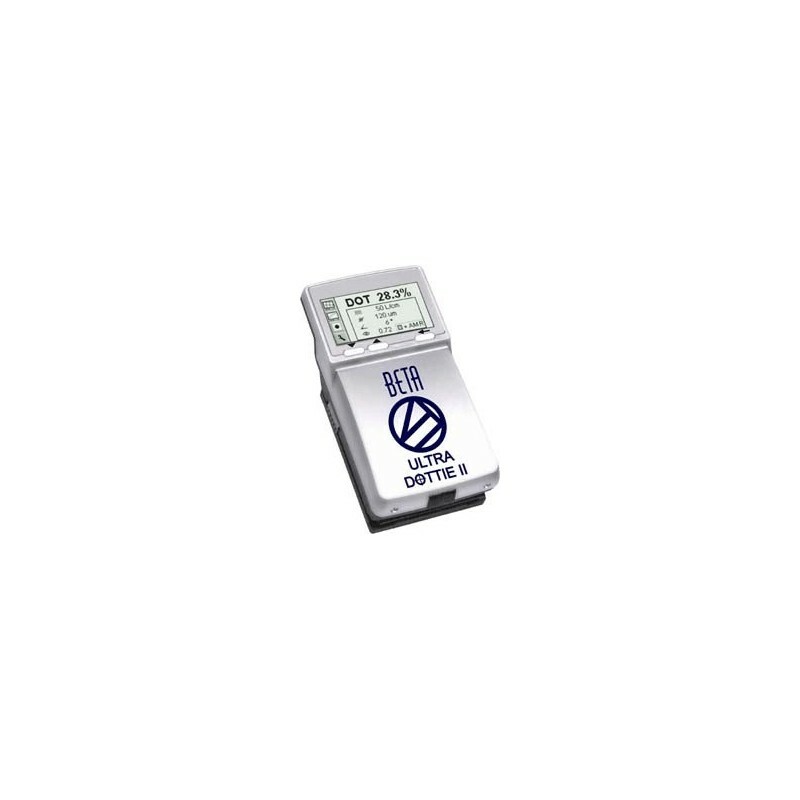 Beta Target:	satisfies ISO 9000 requirements by creating a database of test and calibration data. The reference target uses microelectronic fabrication techniques, for perfect halftone and geometry precision. Records the instrument calibration status, operator, with time and date stamps for traceability. All this PLUS: 3 Year Manufacturers Warranty and Unlimited Technical Support!